Set the wayback machine to 1998. Parallax View presents reviews of films originally published 20 years ago by our contributors for various papers and websites. Most of these have not been available for many years. There are moments in Saving Private Ryan when the warfare becomes so intense and all-consuming that the very air seems filled with battle. Shrapnel hangs there, every shard in razor-sharp focus, as if molecules of the film itself had been startled out of the emulsion. “Din of battle” ceases to be a cliché and becomes an implacable, immediate truth, until the senses, along with reason, give up attempting to process the assault of information and sensation and a lulling roar of water fills our ears. No mainstream American film has ever painted a more horrific or documentarily persuasive picture of modern combat. And no Hollywood film within recent memory has achieved such richness and originality of texture, such a compelling amalgam of passionate human drama and awesome technique. The Italian Job got past me but, from what I can tell from descriptions thereof, it set in motion a trend in Peter Collinson’s work that is continued in Innocent Bystanders. The potentially portentous title notwithstanding, this latest Collinson takes us far from the significance-laden likes of The Penthouse, Up the Junction, and A Long Day’s Dying into the region of closeup slambang for (commercially if not morally) pure purposes of entertainment. The government arms that manipulate poor, physically unsexed Stanley Baker and his fellow/rival espionage agents are unrelentingly portrayed as cold, inhumane entities staffed by inhuman types like Donald Pleasence (who manages to be amusing about it) and Dana Andrews, but this has simply become a convention of the genre these days and no longer counts as the subversive gesture it once was in the black and white morality plays of Fritz Lang and the crimefighting semidocumentaries of Anthony Mann. 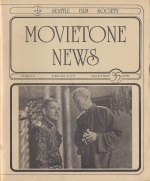 From Disraeli and The Life of Emile Zola, through Madame Curie, Lawrence of Arabia, and Funny Girl, to Gandhi and Michael Collins, the biopic has been among Hollywood’s most venerated genres — the means of conferring cinematic immortality on history’s superstars and, more often than not, Oscar glory on the enshriners. Also more often than not, the filmmaking has tended to be as stodgy as the subjects were august. 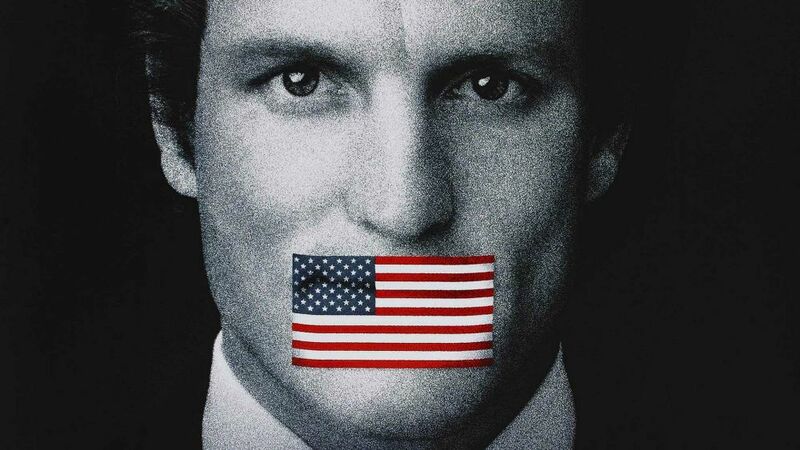 The People vs. Larry Flynt knocks both of those traditions for a loop (we nearly said “into a cocked hat” but, in the present context, that might have been in poor taste). No one could pretend that Larry Flynt — ex-moonshiner, ex–strip-club operator, and owner-publisher of the encyclopedically raunchy Hustler magazine — is a candidate for respectability. And no way would Milos Forman — who previously made the vibrant Amadeus — adopt a conventional, reverential style or tone in bringing Flynt’s life and often dubious achievements to the screen. Yet the surprising, deliciously problematical, and finally exhilarating truth is that Forman’s boisterous serio-comedy attains complexity and, yes, nobility beyond the grasp of most hagiographies. It also ends up persuading us that its outrageous subject has, too. If my editor hadn’t called my attention to it, the premiere episode of Hill Street Blues would very probably have come and gone without my notice. Hundreds of television series have. But he knew I liked Lou Grant, and this show “from the producers of Lou Grant” (the hypesters’ phrase) was, on the basis of preview, similarly successful in “being funny when it wants to be funny, and dramatic when it wants to be dramatic” (his phrase), and maybe I should take a look. It was getting a modified miniseries sendoff as part of NBC president Fred Silverman’s last desperate bid to turn around his network’s ever-worsening ratings drift and save his job. Who could say whether, if the numbers failed to materialize, Silverman wouldn’t replace it with a jiggle epic, or his successors ashcan it in a combined spirit of slate-cleaning and revenge? So I took the look. 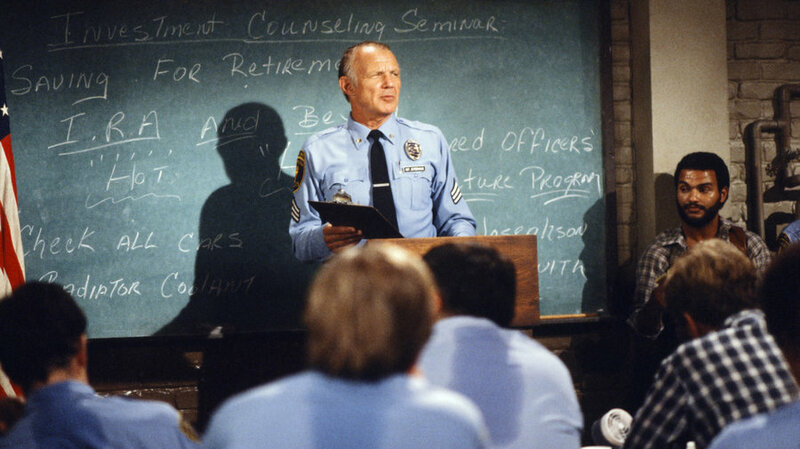 Hill Street Blues: Cop show. Thirteen series regulars identified up front, most of them unfamiliar and most of them frozen in slantwise TV grin. Handheld camera, Action News editing, and overlapping mutters on the soundtrack during the morning briefing that opens the show—manneristic bad signs for the jaundiced viewer, though they did seem to make for an appropriate grab-shot naturalism here. What the hell, give it a chance.